In December 2012, I called it Unthinkable. An encore post that is all too timely. This post changed titles three times already. I’ve drafted two rough starts and deleted both. There’s no making sense of the news from Newtown, CT. In its place, a flashback that hits me every time one of these unbelievable tragedies occurs. She said yes, of course. When she asked for teachers to volunteer, I joined up. Along with most of the city’s liaison officers, several higher-up district administrators, and all the school principals in town, we teachers filed into a high school auditorium to watch an analysis of the Columbine High School tragedy. The officer in charge pointed out the main things that went wrong and then used that to tell us the rationale for the new training. The method that was new then is now the norm for mass shooting scenes. CBS News interviewed one who helped put the philosophy into practice. “Go toward the shots,” he said repeatedly. “Neutralize the shooter or shooters.” It’s what we practiced, and it’s what they still do. Sandy Hook Elementary School had staff who knew what to do. The principal’s last act may have been turning on her PA microphone in an attempt to inform the rest of the school that there was danger. Children told of calm teachers who pulled them to safety, hid them in corners and in closets and in cubbies, and evacuated them swiftly to the gathering place, a nearby firehouse. Press conferences and news releases were, so far, compassionate and respectful. Grieving parents photographed from a distance, parents of surviving children showing support and empathy for those who lost theirs. But – there were no bodies, no blood, no attempts to show or suggest the carnage that remained in the school building the television cameras. For this thoughtfulness, I’m grateful. I hope members of the media continue to respect those touched by this tragedy. But did this mass murderer show signs beforehand? We hear too many stories after the fact. Red flags, as we call them in education, fly up and grab our attention. Then files are filed and the students drop out or move out of town, out of state, out of range. The medical files remain sealed, and the only public statements come from the distant memories of people on the periphery, not close enough to have intervened. Our public safety forces know how to get in and stop mass attacks like this. But so far, too few people know how to prevent them. And that still scares me. Remember when – before school safety drills? Almost twenty years ago, it was. I taught in our neighborhood school, a relatively small building with a student population of, oh, maybe 300, max. In a tornado drill, we could fit the entire student body in the maintenance engineer’s basement storage room. In a fire drill, we could exit the building quickly and get back inside before the lessons were forgotten. Then one day the fire alarm went off – in the rain, and during the lunch period. No one knew who pulled it or if something had malfunctioned. There was chaos at first as kids tried to figure out which exit was closest. Then there were moans and groans of “It’s raining! Hard! I’m getting soaked!” Principal and police liaison swept the school as quickly as they could and sent us all back inside. And then the alarm went off again. This time, teachers grabbed their umbrellas and cell phones. We checked in with each other, brought the kids around to the same side of the building, and actually took shelter in a neighbor’s (thankfully large) garage. And then, someone started to whisper. “Someone could have shot us all. Like in Arkansas, right?” “Or in Colorado. That place with the kids in trench coats.” Jonesboro, Arkansas: March, 1998. Littleton, Colorado: April, 1999. Suddenly the cold spring rain didn’t matter quite as much. All of us, teachers and students, were cold and wet and scared – but no one was shooting. It was okay, sorta kinda okay. Today, many years later, schools often drill during the lunch period “just in case.” Many schools have an alternate location set up in case of rain or bitter cold. All of these are good signs, signs of progress in keep our students safe. Today, many years later, we drill to keep kids away from a potential active shooter. We did lock down drills for years. Now we conduct ALICE drills – Alert, Lockdown, Inform, Counter, Evacuate. No matter what the name, schools practice getting students out of the way when someone comes into a school with a weapon. No matter what the safety procedure, children and adults still get killed. And this, my friends, is not good. Not good at all. Your behavior during the Olympic Opening Ceremonies was tacky, unsportsmanlike, and just plain wrong. By standing only for your own country, not even acknowledging the Korean hosts of the game, you showed the America First attitude at its worst. When you support abusive men, women are listening. We’re listening, and we vote. You responded to 17 deaths in another school shooting by telling us that “This is not the time to jump to some conclusion.” No one is jumping anywhere unless they’re jumping out of range or running for their lives. Who Are The Next School Shooters? Who are the next school shooters or mass shooters? How can we recognize them, and how do we stop them? It’s a complex problem, and stopping the mass shootings that are becoming all too common will require a complex solution. Activists work to tighten gun laws. They want to outlaw guns like the AR-15, guns with only one purpose: killing. They want to require background checks, thorough background checks, any time a person buys a gun. Mental health advocates work to help people who might consider carrying out such a shooting. Depression, anxiety, and more can be factors in producing a killer of many. Not to be forgotten are the National Rifle Association (NRA), those who work to keep gun laws weak and widespread access to weapons strong. It’s a complex problem. After Sandy Hook, after Columbine, after Parkland, expert and not-so-expert analysts look for red flags, events or ongoing stresses that might have built up the pressure on this individual. After the fact, folks in the know pick through a shooters’ profiles and backgrounds, identifying possible triggers, the proverbial straws that broke the camels’ backs. It’s a social problem. Was the shooter harassed? Bullied? Excluded and isolated? Did anyone reach out to this person? Did anyone recognize the risk, help this person before the potential for disaster became real? It’s a medical problem. Mental illness, diagnosed or not, can be a major factor in someone deciding to carry out such a horrific event, taking lives of so many others. Mental health care must be available to all who need it – and mental health coverage must be part of any health plan. It’s a legal problem, a gun problem. That’s hard for me to say because I know so many responsible gun owners. Hunters, mainly, these friends would never dream of leaving their firearms loaded and accessible to someone – anyone – who might misuse them. That said, no one needs a semi-automatic for hunting game. The AR-15 that’s been in the hands of so many mass shooters doesn’t need to be legal. It’s an accessibility problem. Felons, domestic abusers, people who have been identified as a danger to others must be prevented from owning guns. License to kill only exists in fiction. In reality, life is precious. It’s a complex problem, and the solution will not be simple. I wish I had an answer. I was disappointed in NBC’s Olympic coverage. I couldn’t find anything Olympics-related on Sunday morning – not even a compilation of the previous night’s action. Korea is halfway around the world, I thought, they could have some live events. Four years ago, I watched the Sochi games all day long. I mean that I watched morning, afternoons, evenings – all Olympics, any time I wanted to see it. I was home, resting on the couch, recovering from major surgery (hysterectomy). It was fun having something interesting to watch; I’ve never really gotten into the daytime soaps. Four years ago, I slowly recovered my strength and also my vision. The left retina had come loose. I’d had emergency surgery to reattach it in December. The hysterectomy and all it entailed was the second surgery within as many months. Learning about ice dancing and snowboarding was a nice distraction from all the crazy punishment my body had taken. My boss had hired a sub for me, which was a relief. In my online teaching world, we don’t hire substitute teachers for day to day illnesses or short term events. A six week post-surgical leave of absence was a different story. I had a sub, which was a relief – at first. My substitute didn’t quite get the concept of building a rapport with the families, and they were not quiet about it. Our principal had enough complaints that she fired the sub two weeks early. I was tempted to go back early, but I didn’t. It took some will power to stay home and take care of myself. Four years ago, I had no idea that I had yet another procedure ahead of me – a carotid catheter exam, followed by the insertion of a stent in my right interior carotid artery. That time, I didn’t have any Olympic games to distract me. A little baseball, maybe, because this happened in late April. Or was it early May? I just remember feeling overwhelmed with so many major health scares. Fast forward four years to the current Olympic games in Korea. I’m healthy enough (knock on wood) to be at work full time, so I guess it doesn’t matter if there is daytime coverage or not. Go U.S.A! U.S.A! Daisy(musing): I don’t remember ever seeing so many crashes in ski events during any other Winter Olympics. Daisy (to self): Then again, I haven’t really watched as much of any previous Winter Olympics. It’s true. This year, I was home on medical leave, recovering from major surgery. I was resting on the couch, coffee cup by my side, laptop nearby and television on for most of the 2014 Winter Olympics. Amigo and I had a lot of fun watching and listening and discussing various events by day, and Chuck and I enjoyed evening shows. Snowboarders are fearless and amazing people. Add freestyle skiers to that definition, too. Shaun White, despite not medaling, was a classy guy who celebrated his opponents’ successes. Figure skating judging will forever be questioned because of the combination of skill and style. Let’s not begrudge anyone the gold, even if she has home crowd advantage. I enjoyed the Today Show each morning, too. They managed to interview all the recent medal winners and media darlings and have fun doing it, too. With the time difference, I would watch the day closing in the mountains above Sochi while I watched the sun come up here in Wisconsin. It was a pleasant way to start my day while recovering and healing from a major surgery. I did have a few favorites. I liked seeing the back stories from the athletes, even those back stories presented through commercials. There was a short feature on figure skating costumes, especially the women’s costumes. Those little bitty pieces of fabric are expensive! A friend on Facebook mulled over a question that seems to have no answer. How is it that USA bobsleds are designed by BMW, but figure skates look the same as the pair you would buy at Goodwill or Play it Again Sports? Input, anyone? Speed skating has gone through a few skate changes, but what about figure skating? My favorite interview and my favorite moment remains Ice Dancing. Meryl Davis and Charlie White, Midwestern young people from Michigan, skating together since they were young, brought home the gold medal. 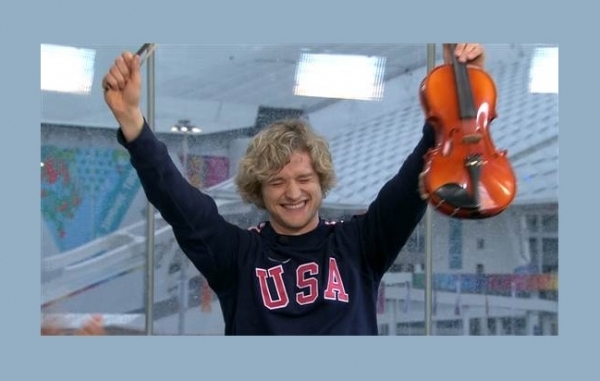 Suddenly, ice dancing is a Big Thing in the U.S. And then, during the interview, it came out that Charlie also plays violin. He’d casually promised the Today Show that if they won gold, he would play for them. I’m sure he never dreamed he’d be pushed to follow through, but when they presented him with a borrowed violin, he did. Gold medal performance, it wasn’t, but his moment in the spotlight still spoke volumes for the arts, for music, and for well-rounded young athletes. So there you have it, folks, Daisy’s summary of the 2014 Winter Olympics. I won’t talk about hockey (USA lost to Canada), or that Polar Vortex that’s coming from Canada to add insult to injury. If only they’d keep Justin Bieber, too. I can’t make this stuff up. Amigo: Yea! It’s Fight Night tonight, starting at 7:00! Daisy: You can watch it upstairs while I watch the Building Off Grid marathon. Chuck: What?!? Waaaaa! I wanted to watch Star Trek! Daisy: no words, just frowned. Chuck: It’s the new series, and I recorded it! Chuck: Oh, okay, I’ll watch it later. Amigo: On my way upstairs! grabs iPhone and Bluetooth headphones and heads upstairs to drag a bean bag chair into our room and watch Fight Night, televised from Brazil. I’m still sending postcards to my elected officials. I write them in cursive in the hopes that it’ll make the office interns have to work to read them. I did tell a certain office-holder that eliminating Net Neutrality would cut down the number of followers to his Twitter feed. But other than that, I’ve restrained myself rather well. Here are a few messages that have gone through my head, but not through the mail. A secret society in the FBI? What’s next, a conspiracy theory about the moon landing? A committee to find Communists? One Red Scare was enough, thank you very much. We Wisconsinites are not proud that McCarthyism started with one of our own. Your letters are long, wordy, and low on substance. Many times your responses seem to carry the intention of educating your constituents. Unfortunately, your man-‘splaining essays do more to insult the intelligence of your well educated voters. Keep fighting the good fight. You have many supporters here in our fair state. You’re good with numbers. However, you keep forgetting that each number on your spreadsheet represents a real person. A person with rent or a mortgage, a person with bills to pay, a person who pays taxes. A person, if she has the proper ID, who votes. Have you read the story “Kaddo’s Wall”? My students, unprompted, said that Kaddo reminded them of you. Oh, what am I thinking? You’re not a reader.